...doesn't have to be terribly expensive. Ever since my re-encounter with Urban Outfitters (here) I began looking through their website specifically their home decor and I was quite impressed. Their lighting in particular has some great and inexpensive pieces like the pendant above (its only $64!) I think its look is more sophisticated than its price which is always a wonderful thing in my book. Another shiny and affordable beautiful little thing is this cute pink and glam all over painting. What do you think? Next up- If you are still yearning for that famous golden piggy bank but couldn't allow yourself to spend the money go for this great piggy bookend alternative by CB2 for only $30. I think this little piggy needs to go weweweweeeee all the way home to my library. Also, I'm loving this cowhide rug with some gold sparkles throughout. It would look so beautiful with some neutral toned furniture. Divine! I think its very nicely priced for all of its style (read the store owner's blog here, so funny!) And voila the perfect little stool for any little corner. Gorgeous! That painting is so beautiful! Great post my dear! Many kisses xoxo! Fabulous! Thanks for these great finds. OMG, I once designed an entire room around a pillow I found at Urban Outfitters. They have some fun things for great prices as you found out ma dear! lol, re: the piggy. 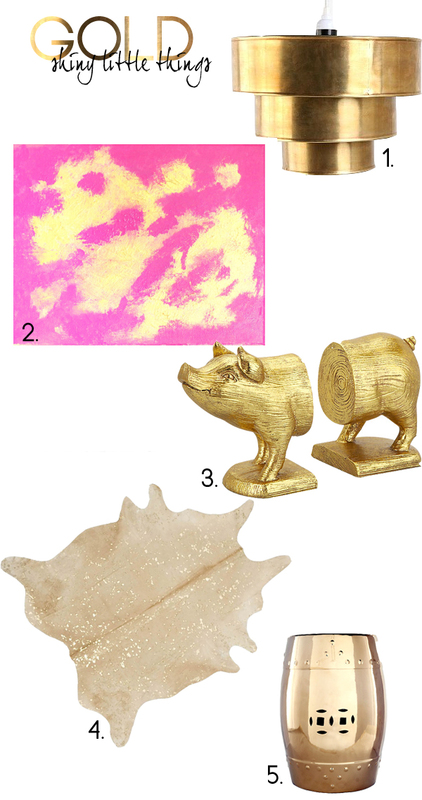 I gotta say the little piggy and that pendant light are my faves. Definitely gotta check em out for my next project. Great post. I love their funky stuff... It's always so much fun to go to their stores and check them out!